Swanton Novers is a small parish and village situated 13km south of the coast, in the North Norfolk Local Government District. The parish has an area of 543 hectares, and is dominated by the Neat’s Close, Little and Great Woods. The name ‘Swanton’ is thought to derive from the Old English for herdsman’s enclosure, and the name ‘Novers’ refers to the fact that Milo de Nuiers held the area in 1200. The earliest monument is a possible barrow site, situated in the southern part of the Great Wood (NHER 40182), which may date to the Bronze Age. Of earlier date are a number of tools (NHER 3215) and a polished axehead (NHER 11333) dating to the Neolithic period. Although this is not the smallest parish in Norfolk, only 16 records exist in the NHER for Swanton Novers. This is likely due to the fact that large amounts of the parish are covered by woodland, and any features or objects buried below the surface remain undisturbed by modern agricultural activity. As a result, there are no recorded monuments from the Roman or Saxon periods, and only a few Roman pottery sherds (NHER 3217) have been recovered. Despite this it should be noted that the parish was valued well in the Domesday Book, no doubt because of the quantity of woodland. A survey undertaken in 2004 recorded a number of features such as ditches and hollows in the Little Wood (NHER 40181) which are thought to be medieval in origin, as well as ditches and banks in the Great Wood (NHER 40182). The church of St Edmund (NHER 3218), situated some 500m west of the village, now represents the most substantial medieval remains, although the body of the building was almost completely rebuilt in 1881, and the tower rebuilt in 1960. However, inside a 15th century octagonal font and ogee-headed piscina survive. The village was an estate village for the Melton Constable Hall estate, and so there is little evidence of a manor or hall. The two surviving buildings of architectural note date to the post medieval period. These are Dennisby House (NHER 47232), a brick and pantile building of around 1840, and Swanton Novers House (NHER 47896), a large late 18th century house of red brick with several wings. Perhaps the most notable archaeological aspect of the parish is the number of brick and pottery kilns known to have been in operation during the post medieval period, when clay appears to have been quarried near the Great (NHER 40182) and Little (NHER 40181) Woods. Though the majority of these have been destroyed (NHER 3219, NHER 15222), the remains of one brick kiln (NHER 3248) do survive. It is thought that these kilns, which were situated on what was once the village common, were owned and operated by individual families. World War Two also left its archaeological mark upon this parish. 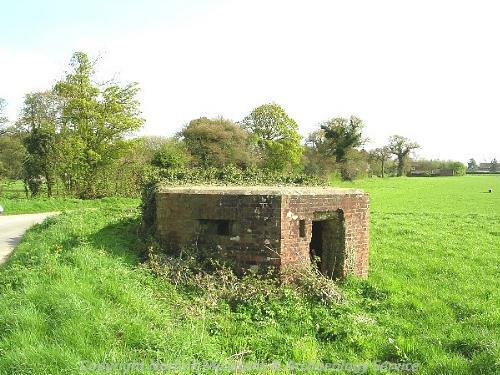 One pillbox (NHER 13443), now destroyed, was situated in the northeast of the parish, on the junction of the road from Melton Constable, and another is thought to still survive (NHER 18621) some 850m away.